Orbost, Victoria to Tuross Head, NSW. We are sitting in Jen and Lei’s kitchen cooking curry and home made naan bread and drinking wine. It feels like we have been friends forever. This is a beauty about life on the road. We have been on the receiving end of such amazing kindness and hospitality everyday in both big and small ways. From local knowledge about the best place to stop and have lunch, to random offers of a bed for the night to avoid sleeping in a tent during the biggest storm to hit the east coast in years. These two experiences bookended the second week of our journey. 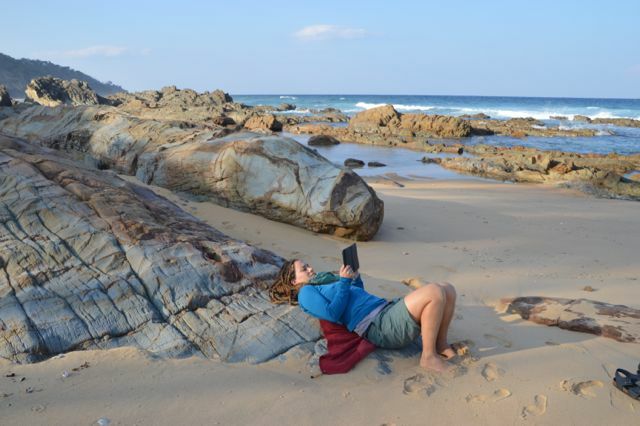 Sardine Creek Track is the best place to have lunch and an afternoon nudie swim on the road to Goongurrah. Yes a nudie swim. It is the way to go when cycle touring (and lazy) as you don’t have to get into/out of your bathers or dry them. I may one day write an ode to the nudie swim (which I will post) but I will continue now with the story of the road out of Orbost. The day before we had made the choice to cycle the Bonang Highway to NSW, avoiding the crazy drivers on the Princes Highway. It was the best choice. 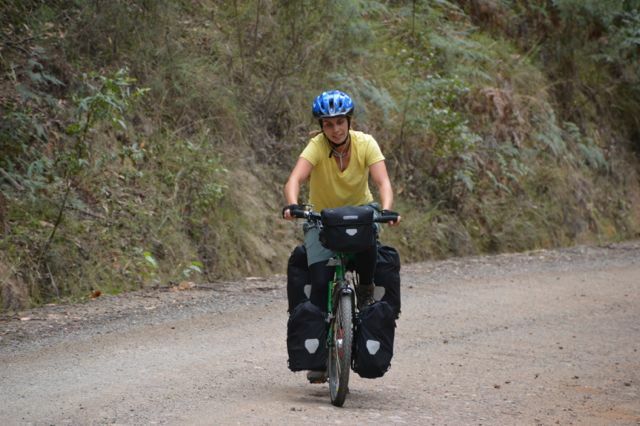 That first afternoon we covered 70km along the river and valley north of Orbost. It was easy riding and a good way to distract ourselves from the sadness of leaving dad and Misch that morning. 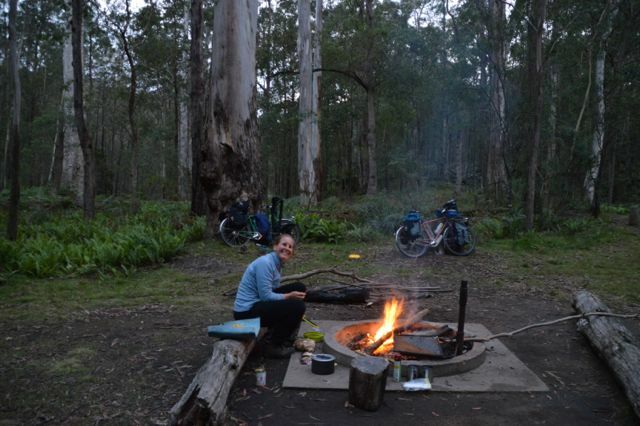 Goongurrah is described on the map as a “town of greenie types” (read activists for anti-logging of native/old growth forests) and the free campground is one of the best we have stayed at. If you’re ever in the area stay there and make dinner from the organic produce that the locals sell from the old fridges and ovens they use as letterboxes. Happy to have arrived in Goongurrah after 70kms in half a day. The next day was a bum and leg breaker – literally. 20 kilometres of uphill riding through some of the most beautiful old growth forests in Victoria. We had the Snowy River National Park to our left and the Errinundra National Park on our right and I was in rainforest heaven. 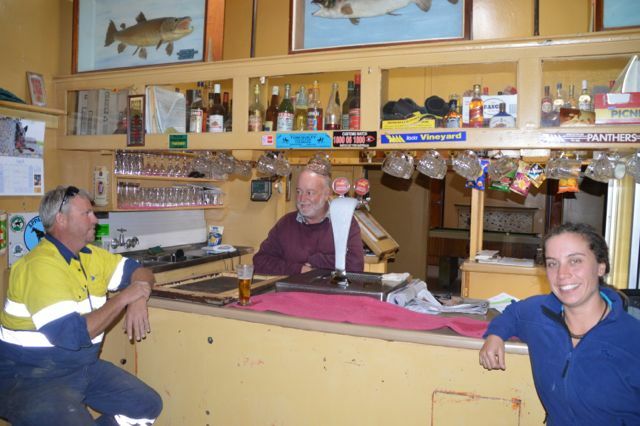 We had been advised that the town of Bonang no longer had any facilities, but that Bendoc had a pub. So being the beer lovers we are, we took a right off the Bonang Highway, cycled for another 20km up a dirt road and arrived at the Commercial Hotel. Margaret and Graham plied us with beer and stories of the local area and then sent us on our way to cross the NSW border. 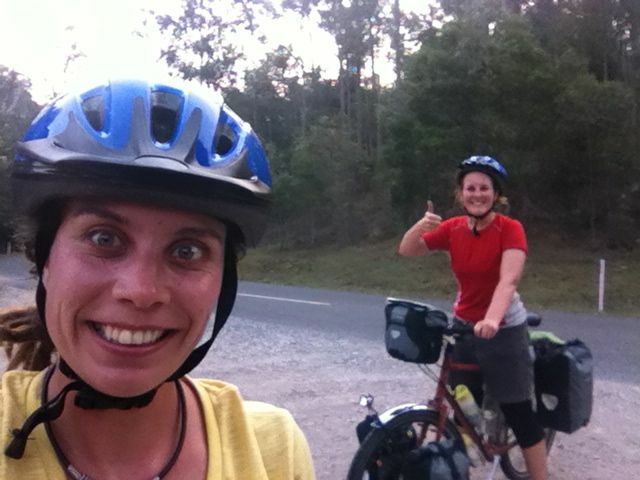 We couldn’t believe that we had cycled across our state and into the next. We would have posted a ‘Welcome to NSW’ sign, except there wasn’t one! We made it to the border! 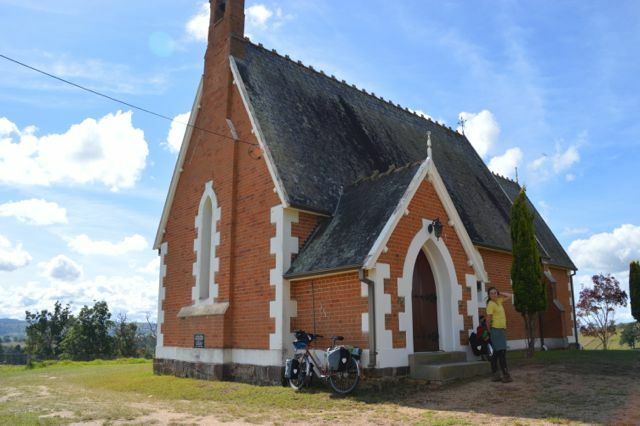 We have read many lamentations from cycle tourists about the undulating roads in NSW. So we were ready for the constant ups and downs that we have experienced since crossing the border. We cycled through the high plains of the South Coast Range, admired the quirkiness of the town of Cathcart that still has the original houses built in the late 1800’s, were gifted bunches of flowers by a random stranger and had a campfire in the beautiful surrounds of the Six Mile Creek campground. Having a campfire at the Six Mile Creek campground. The next morning we were expecting more uphill as the road out of the campground was straight up. Our legs and bums were afraid. But within a few kilometres the road started going down. And down, and down and down! It was fast, crazy fun and we were enjoying the first bit of serious downhill for days. Near the base came the first close call for the trip. Luckily for us the car was going slowly as the road was steep and made of dirt. We all swerved and thanked our lucky stars that the journey did not end less than two weeks in. Camels outside Candelo and the road we road in on. This was soon forgotten as we rode along the creek edge listening to the bell birds singing and watching the dairy cows chew cudd. As we climbed into the town of Candelo I looked up to the right and saw the oddest sight of camels on the hilltop. We are not in Melbourne anymore Toto. While drinking coffee we met John the caretaker and tour guide of the old township of Kameruka. He regaled us with stories of the Tooth family and when we cycled passed we took a detour to see the property. Another beauty of cycle touring, speaking with many local people who are the custodians of a rarely known history of their own areas. The church at the old town of Kameruka. 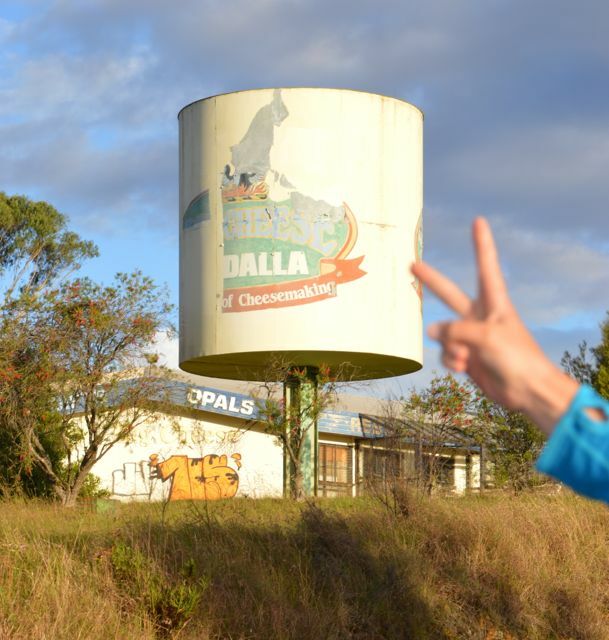 From here we passed into the cheese capital of the area – Bega. Stocking up on food is a daily necessity of cycle touring and our aim is to buy as much nutritious food for the lowest price. The reduced price section of the supermarket is our favourite. From here we cycled over the Doctor George mountain range, playing tag with a couple of backpackers in a hippy van, until we reached our destination – Mimosa Rocks National Park. The last few undulations along the dirt road to Middle Beach almost had me in tears as it had been a physically and emotionally tiring day. We washed the days stresses away with a nudie swim in the ocean, a dinner of hand picked pine mushrooms and a fire. We were joined during the night by a bandicoot that loved to eat chocolate. Middle Beach, ready for a nudie swim. The chocolate loving bandicoot and Ella. The next day we had one goal – to find some drinking water. We have been filling up our drink bottles and water bladders at every town and stream when needed. We did not think that a national park would a/ not provide water and b/ not sign post this information before you drove into the site. When touring, you can’t just pop down to the next town 35km away as this will take 4 hours. Enter Vincent, another lovely local with loads of information and most importantly water! He suggested a move from Middle Beach to Blithey Inlet for more spectacular views. There we spent the day swimming, reading, eating, walking and meditating. Our campsite was at an old windmill site on the cliff edge protected by bushes and long grass. 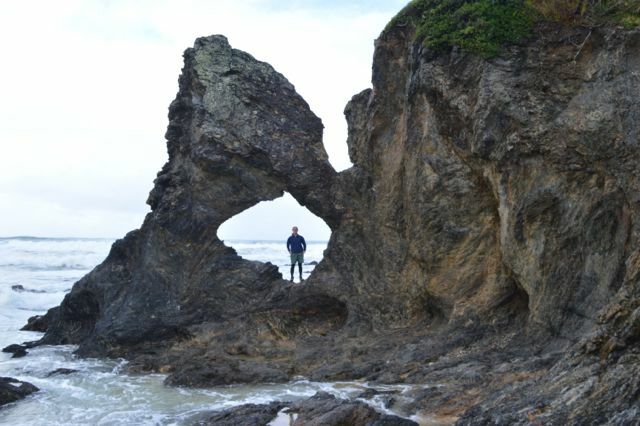 We needed it that night as a storm started brewing, and the next day a strong southerly blew us and the occasional rain storm towards Bermagui. There on the headland we looked out over the ocean and had a toast for Rose. 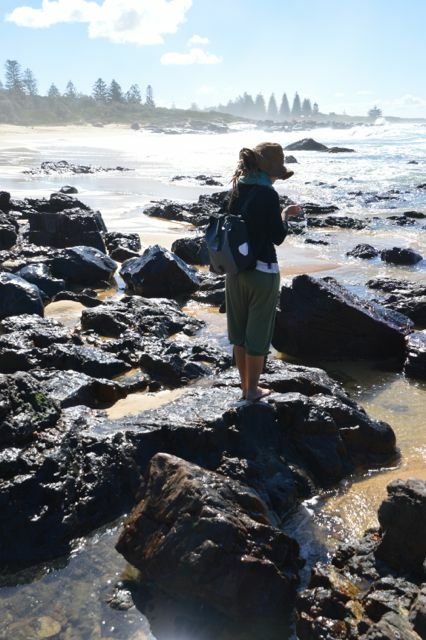 Feeling sad and with the weather being so bad, we had dragged out our time in Bermagui. Things happen for a reason. As we were about to leave Steve drove up and informed us about the huge storm heading our way and offered us a warm bed and a hot shower that night. We needed no further convincing. In their lovely home with the open fire burning, Steve regaled us with stories of cycle touring the world back in the 1980’s, Monita chatted with us like an old friend over numerous cups of tea and coffee, Jason entertained us after a few beers at the pub and the menagerie of animals gave us affection. As we lay in bed that night with 100km/hr winds and violent rain pounding the house, we were thankful we had again been on the receiving end of such kindness. The bad weather continued on into the next day, and so that we didn’t lose the kilometres that we needed to cover to get to Sydney in time, that afternoon Steve and Monita drove us up the coast to Narooma. On the way we made a tour of the coast line and watched the seas pounding and white foam covering everything. 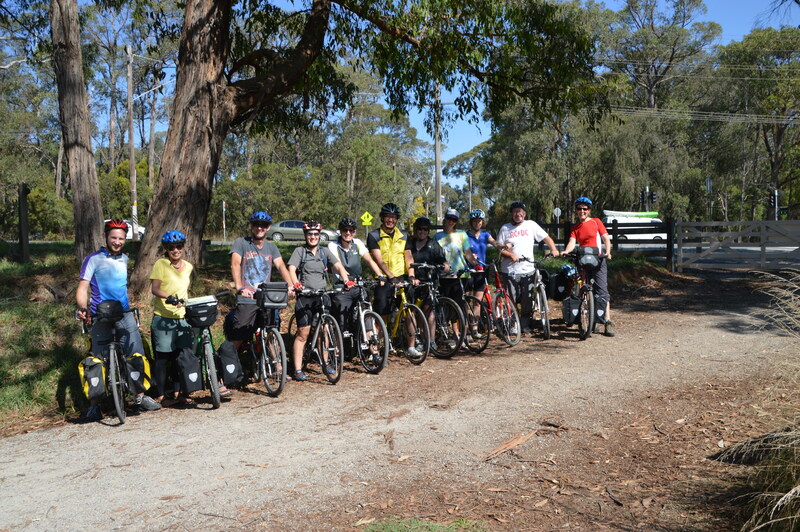 We wished our new friends a fond farewell and headed along the new cycle path from Narooma to Dalmeny. 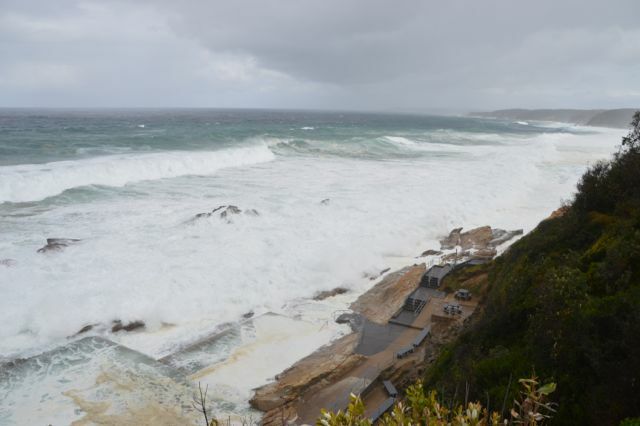 Views of the ocean were occasionally obscured by the heavy rain that fell, yet by the time we had cycled to Bodalla the sun was shining and the hill riding had dried our clothes. It was a cute town and we stopped at the local cheese factory and sampled their amazing wares. I was also excited to discover “the big cheese” as we cycled out of town. 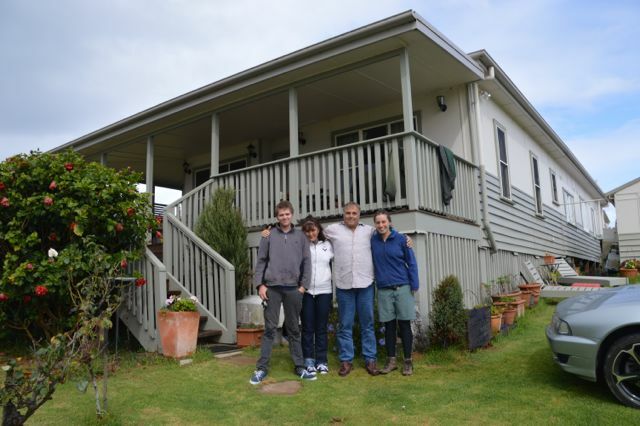 We made it punctually to Tuross Head that evening and entered the lovely home of Lei and Jen. Great conversation, travel stories and laughter filled the evening. Homemade pizza and wine were on the menu. Their dogs and cat plied us with/for affection. Before bed that night we were offered the opportunity to stay the next day, explore the beautiful town of Tuross Head, and Lei would the following day drive us further up the coast so that we would again not loose the kilometres. It’s a hard decision to make at the beginning of a cycle tour, and after some extensive consideration we accepted their kind offer. A view of Tuross Head from the Princes Highway. 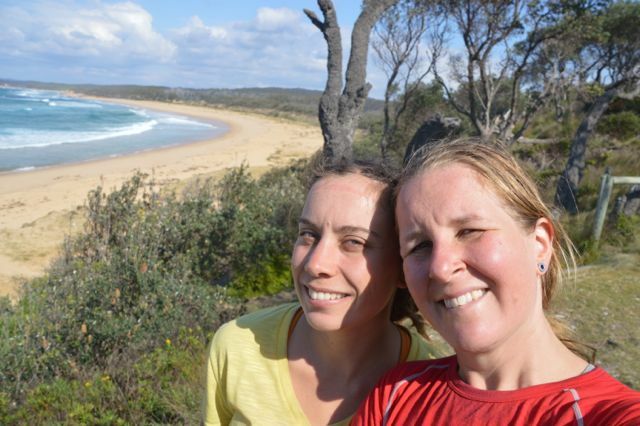 We spent today exploring the beautiful beaches, lakes and gardens of Tuross Head by foot and bike. Lei has a great love for his town and provided us with a wealth of information about the area. And now the story ends where it began – curry, naan bread, wine and great people. So, after all the anticipation and preparation, the day of leaving finally arrived. It was really an incredible feeling cycling out of Lewis Street, the place where I have grown and changed so much over the last few years. I have so many fond memories of that house and could probably wax lyrical about the meaning of place, and love of the suburb that I have spent the last 4 years in. However, this is supposed to be a blog about cycling so I should probably get on and write about that. After being fed amazing breakfast by Key our next stop was for delicious coffee thanks to Tan, Dusan and Zozo at Farouk’s Olive. It was here that we also picked up our first awesome cycling buddy, Pablo. And then it began, through the stirring suburb of Thornbury and then along the eastern freeway bike path. 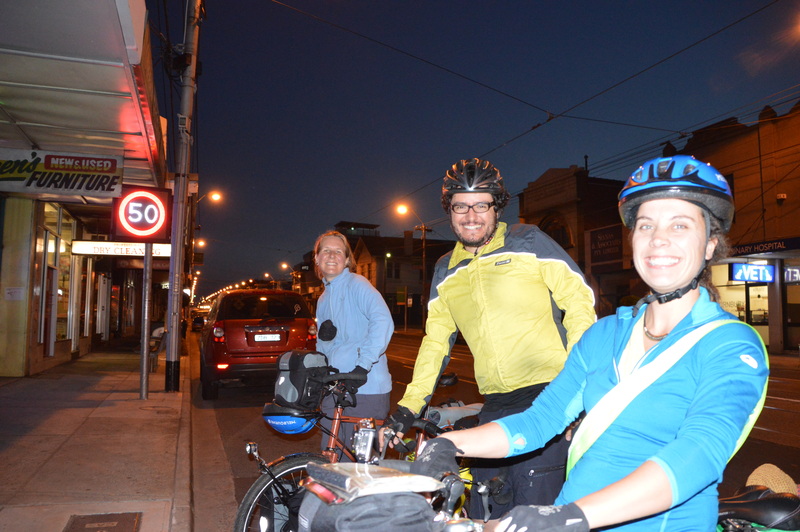 We peddled in silence, on unfamiliarly heavy bikes, through parklands and awakening suburbs. The heavy morning mist eventually lifted and a brilliant sunny day showed her face. At Blackburn road Kev joined us and guided us the back ways through the eastern suburbs of my childhood. We even cycled through Eastland (aka the vault of human suffering, or more simply, the vault). Finally after a grinding climb we were in Mount Evelyn. The hardest part done. Here we were joined by a whole group of awesome friends and the afternoon was spent cruising down the Warburton trail, chatting and trying not to cause a head on with other cyclists by riding side by side. It was a party atmosphere and I kind of wished they could all come with us to Scotland. We rolled into Warburton about 3.30pm post a beer/lunch stop at the Launching Place hotel. There was even an awesome, cheering welcoming committee to meet us. At the caravan park, family and more friends joined us and the party atmosphere continued. It was truly a wonderful send off. 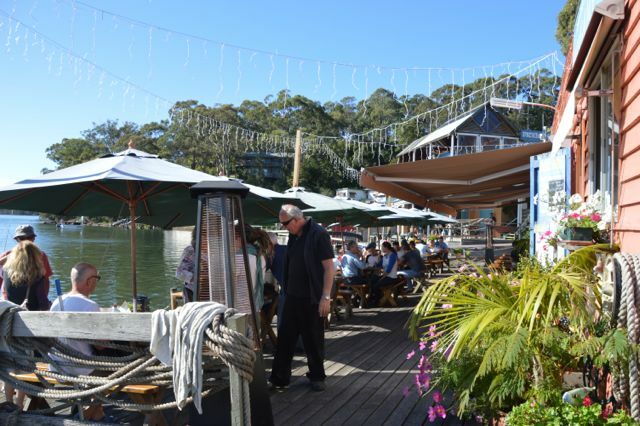 Thanks to everyone who came to our parties, who met up with us for breakfast, lunch, dinner or drinks in the last weeks and those who came to Warburton. We feel very loved and will miss every one of you. Joined more friends, Warburton Trail, Mt Evelyn. 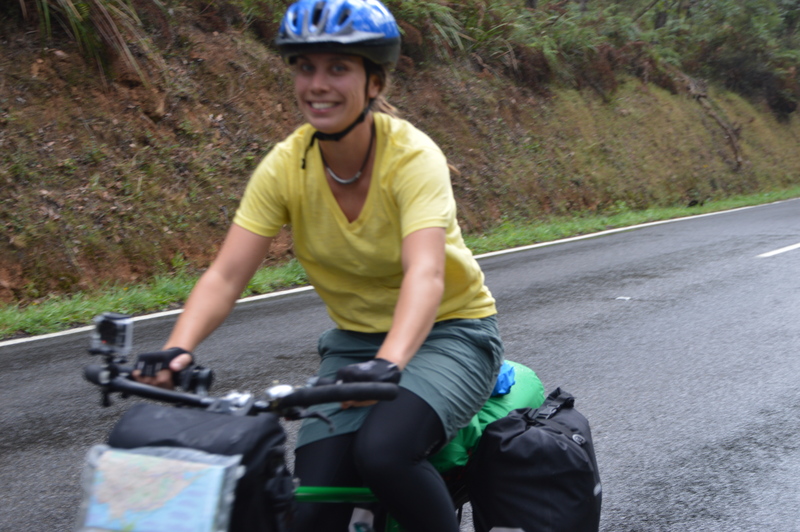 After some teary goodbyes, it was just Astrid and I cycling down the road towards Noojee. I really didn’t know what to feel, so instead I just cycled. It really was quite surreal. 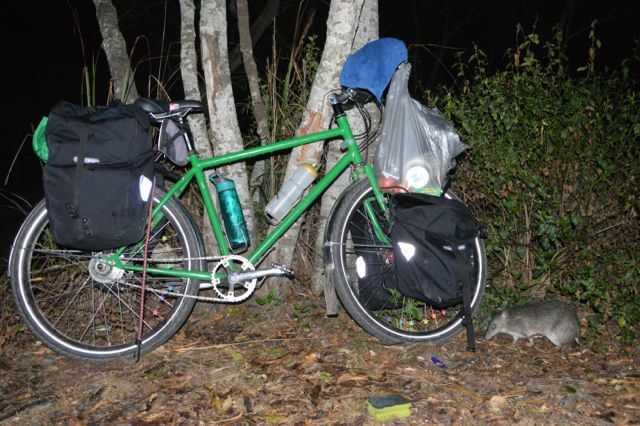 It was now just the two of us, our lives condensed down into 4 panniers and a handle bar bag each. That in itself was quite liberating, considering our culture screams at us to consume and fill our houses with things we don’t really need. Not that we are not guilty of a few luxury gadget’s ourselves but we certainly have a lot less stuff now. 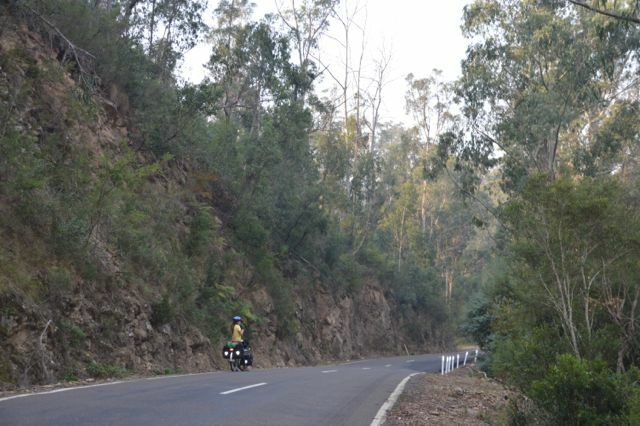 The road to Noojee was mostly gently undulating, surrounded on both sides by forest with the occasional break of farmland. We liberated some apples from an orchard and generally settled well into the rhythm of the road. At Noojee we bought dinner supplies and then got directions to Toorongo waterfall, approx 9km out of Noojee and off the main road. The ride into the valley where the waterfalls were was truly spectacular. The kind of place that is nestled amongst the forest and hills and that makes you want to settle there and start a hippy commune with all your friends. Rolling into the campsite I felt a sense of achievement as well as being slightly overwhelmed by the reality that this was now our life, at least for the next little while. The following day we were more or less broken by a hill. We kind of set ourselves up for this by having a meandering walk to the waterfall (very awesome), meditating, drinking a cup of tea and a leisurely breakfast and not hitting the pedals till about 11am. Then we were confronted by an arse breaking climb out of Noojee. All I can say is that it was hard and I felt a little jealous of the road cyclist that seemed to effortlessly pass us. 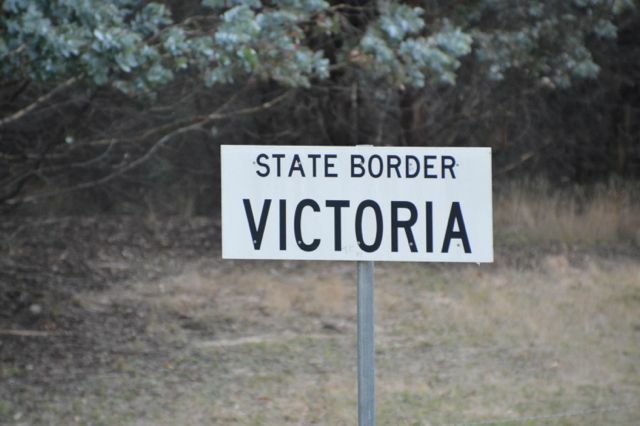 Once over the hill we turned onto the Moe road and continued to wind our way out of the Yarra Ranges, into Gippsland. The road was beautiful, winding and small, surrounded by trees and tall man ferns and barely a car insight. At Blue Rock Lake we made the executive decision to call it a day after only 35km. We were tired and it was nice to have an afternoon to relax by the lake. It was also our first time sussing out an area to put our tent when it clearly indicated camping was not permitted. We found a spot away from everything and waited till it got dark. No one bothered us or even turned up before we left the next morning. Stealth camp win! The day dawned smoggy as the DSE and the CFA are desperately trying to achieve the government’s questionable 5% burn. It appears that half of Gippsland is burning. We haven’t had a smog free day yet. Anyway, sometimes the right people just turn up, right at the moment you need them. We left Blue Rock lake early and were flying along until I felt my left pedal bend. First mechanical hitch of the trip, caused by my failure to tighten the pedal sufficiently. It was bad news as the thread in the crank had been worn away and we could not make it twist back in. Enter Grub, a road cyclists who just happened to be passing as we were seriously considering hitch hiking to Moe (and who really wants to go to Moe if you don’t have to?). Grub returned with a better selection of tools and a fair bit more know how and managed to force the pedal back into the crank. It held till Bairnesdale. Cycling takes you to places that you wouldn’t normally see by car, let alone stop at. Yallourn North is one of those places that if you weren’t craving peanut butter sandwiches you would gladly cycle on by. Seriously weird vibe, views of mines and power stations but very nice Foodworks employees who let us charge our phones while we ate lunch. Down the road a bit we met Brett. He had pulled over specially to speak to us. A keen cyclists he was very excited about our trip and gave us valuable information about the rail trails we were planning to ride ahead. We could have chatted all day but eventually we parted and cycled on toward Tyers. Here we stopped for a snack in the park and had only been there 5 minutes when Brett turned up again. He took us for a drive up to the Tyers lookout while letting us charge our electronic devices in the CFA station where he is a volunteer. The lookout was great and what was even greater is that Brett had been involved in building it and was so proud and enthusiastic about his community, putting in hours of volunteer work in a broad range of areas. All through Gippsland we have been confronted by this sense of pride and community. It really is refreshing and inspiring. It’s not something you come across in the city quite as readily. 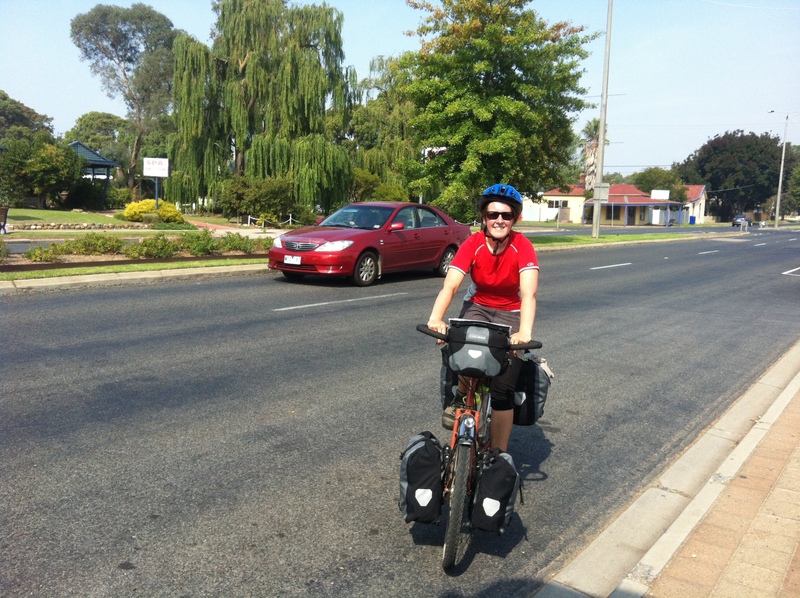 Cycling into Stratford, Victoria. So many of these towns deserve further exploration. Our next stop was Glengarry for a massive vanilla slice of awesome. Here we also joined the Gippsland Plains rail trail. Another kind stranger help us out by giving us the heads up about a broken bridge on the trail and the directions to get around it. I felt elated to be off the road, even though it hasn’t been heavily trafficked. It’s nice not to think about cars at all. The morning had been the last of the hills, we were in flat farmland now and the going was fast, even with the rough surface. We camped in dry forest right beside the track. The sense of freedom of just being able to camp wherever really is superb. The rail trail ended in Stratford, here we met Beth a great lady in the information centre who gave us really good advice about where to camp that night. I got the real sense that Stratford is a town worth a revisit. It has an arty, vibrant and alternative feel to it. We took the back road to Bairnsdale, through farmland and eventually turning off and bumping our way through dirt road and paddocks to find ourselves on the shores of Lake Wellington. An amazing place to swim and spend the night. We woke to rain but it was only light and by 1130 we had done 50km and reached Bairnesdale. It feels good to be getting slowly faster, or is it just the lack of hills? At Bairnesdale we began what I think is the best rail trail in the state. 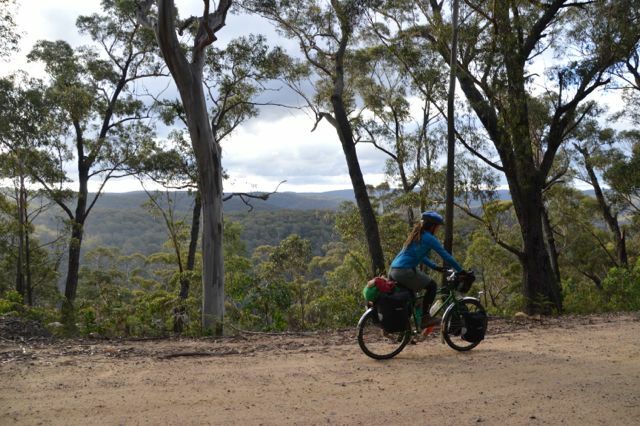 The East Gippsland Rail Trail. It winds its way through farmland at first but then spends most of its time in dense forest, well away from the road. What could be better, beautiful scenic riding away from the cars? Another highlight was the Bullant Brewery in Bruthen and man was I glad to see that. The day was cold and with the constant threat of rain and after nearly 80km I was feeling fatigued and I need of a pick me up. All through Gippsland we had been hearing great reports about this micro brewery and I was keen to see it for myself. Both if us are pretty enthusiastic about micro brewery beer (hipster I know). Finally we were there and I was again reminded about one of the great things about cycling. You may spend all day outside, battling fatigue, hunger and the elements but when you walk into a warm brewery and get served your first delicious beer the experience is so much sweeter then if you had just driven there. This rule applies to bakeries too. Needless to say we had a great hour or so there, tasting brews and chatting to the bar tender. And looking at cows out the window. I must say I was feeling pretty content and happy after that. We only cycled another km or so after that and camped down an embankment right beside the trail. The following morning there was more rail trail awesomeness with a quick stop for lunch at Nowa Nowa which is a very cool town. We got talking to Heather, one of the ladies that runs the shop there and she showed us pictures from when the railway was being built during the early part of last century. I really enjoy hearing people telling their stories about the towns they live in because often those towns have changed from thriving centres to tiny, half forgotten outposts. It’s important that someone remembers their stories. After kilometres of forest, including a race with emu’s (they won, they always win) we reached Orbost, found the caravan park and SHOWERED. Although we have swum almost everyday, it was delightful to shower and wash our clothes. Later we were joined by Vari and Mish who had driven across from Melbourne. Mish came with an amazing amount of delicious food, and yes I totally scoffed it all up. Well a lot of it anyway. It was lovely to have a day off the bike and we spent the weekend at Cape Conran, swimming, playing bad Frisbee and enjoying being with family. So week one is over, our new life has really begun. It still feels not quite real. I miss people but technology really helps and I am having such a wonderful time. It’s hard to describe exactly but I guess life has become very simple in some ways, cycling, finding food, finding water, finding somewhere to camp. It’s soothing and reassuring but also exciting because everyday is different. 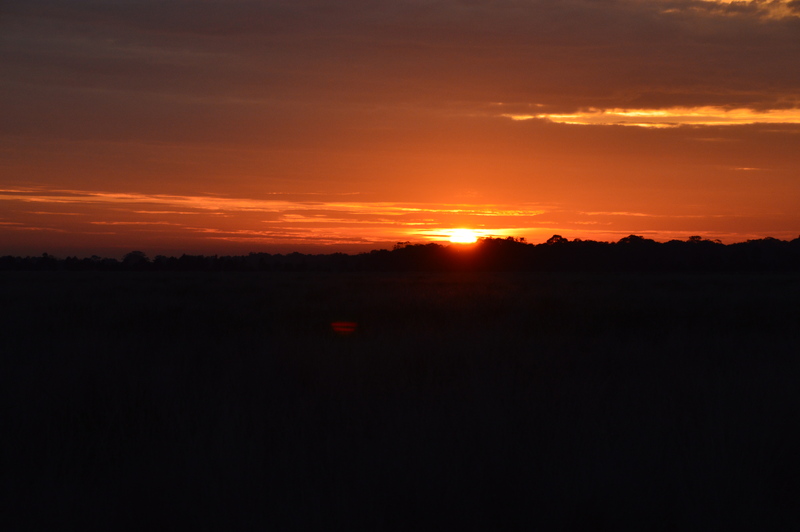 We see stunning sun rises, swim in rivers and camp in forests. Its beauty is in its simplicity. (more photos will be added once we have more wifi time and I figure out how to do it quicker. Ah, technology).